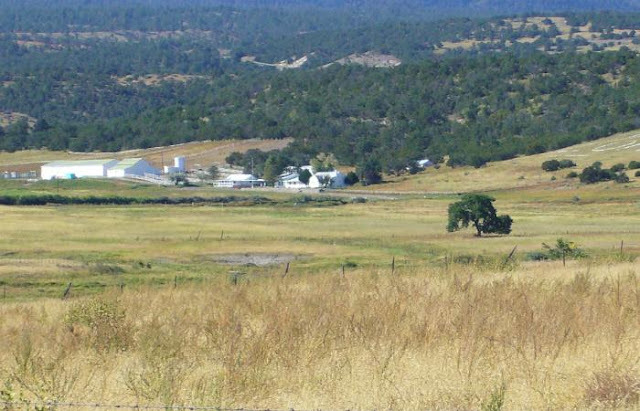 When you drive around the state, you will notice the many changes of scenery. You will see the desert with its ample cacti and a mile or two down the highway, the cacti seem to disappear. The further north and east you drive in the state, you will come upon a thick forest. The lakes in those areas may be abundant with water while the desert lakes and rivers are died up. Along with the many different types of foliage adoring the scenery, there are critters and creatures as well. Typically, snakes, scorpions and lizards can be seen roaming the dry desert floor, while larger animals have been seen in the forests. Once in a while a rare creature or its remains has been discovered in the state. In the Wild West town of Tombstone is where a couple of bizarre creatures lie in a display case at the Bird Cage Theatre. When you first walk through the back door of the Bird Cage’s museum you will first see a glass box sitting on a shelf. Inside the box is a mummified small creature which resembles a mermaid. The bottom half looks like a fish with scales and fins, but the top half has the body of a human and a face like a monkey. 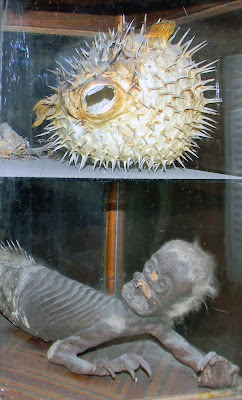 In the upper portion of the glass box is a blowfish. It looks well preserved with its mouth open and body all puffed out. How do two water creatures end up in a desert mining town? What I was told about these strange little beings was that sometime in 1934 a mysterious person donated them to the Bird Cage Theatre’s museum. It was rumored to have been a local businessman, Quong Lee, who once displayed the mermaid in his CanCan Café. He wanted to display it where all could see so he donated it to what he thought was Tombstone’s museum. However they came to be in the Bird Cage Theatre, you should make a point to see these water creatures and all the other original artifacts in the museum. The photo of a group of men standing around an enormous bird has been circulating around for many years. The photo’s title is “Thunderbird” and it was told that the creature was captured near Tombstone, AZ. Many question the authenticity of the photo and if the story was simply an urban legend. Whether it is true or not, the photo and story make for some interesting conversation. This is the story I found while researching the picture: While walking in the Arizona desert in April of 1890, a couple of cowboys spotted a massive flying bird in the sky. The winged creature had a body around 92 feet long and was smooth like a serpent. The wingspan was about 160 feet with no feathers and resembled colossal bat wings. Its face looked like an alligator and it had two clawed feet. The two men followed it on horseback until their rides were too afraid to continue and then chased it on foot. They finally caught up with it and riddle the beast with bullets until it finally died. They snipped off a piece of its wing and brought it to Tombstone. 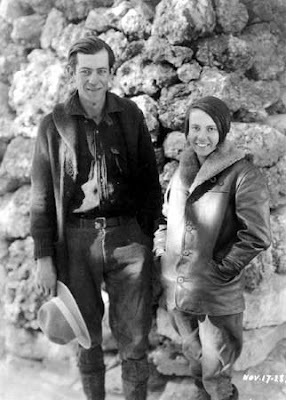 The story of the two men and the huge bird was allegedly written in the Tombstone newspaper, the Epitaph, but employees of the paper searched the archives and found no such story or picture. Many questions are still swirling around about the story and the photo. If there were only two men who shot and killed the flying cryptic, then why are there six men in the photo? And what happen to the story written about their encounter? There are many stories of dog-like creatures roaming around Arizona known as “Chupacabra” (goat sucker). Feared by many, these beasts have been rumored to tear apart livestock and consume their blood. One of the first reported sightings was in Tucson. Two men were roused out of bed by the loud shrieking of their goats. When they went to check and see what all the commotion was about, they saw a weird looking beast on top of one of the goats. This dog-like creature looked at them an unleashed an eerie screech and then scampered off. In 2003, another sighting was report and similar to the first one. This was also in Tucson and it was seen cowering like a frog. 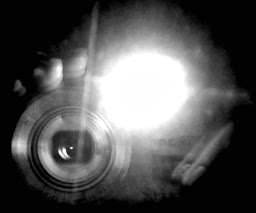 It turned, jeered at the owner and then ran into the darkness. Many believe the Chupacabra are real, while others feel they are just superstition made up to scare people. 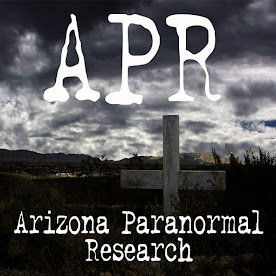 Real or not, there have been many sightings all over the southern part of Arizona. The bones of another very strange creature found in Arizona are that of a Gomphothere. What is that you ask? I wanted to know as well so here is what I found: A Gomphothere is a faint kin to elephants with broad snouts and elongated jaws similar to a crocodile. 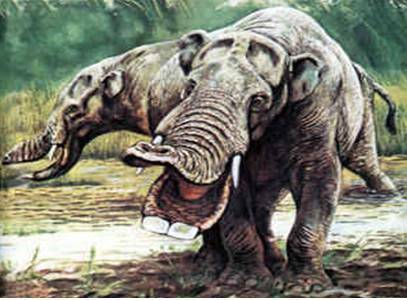 They were found in North America over 12 to 2 million years ago and were around 9 feet tall with two or four tusks. The bones of these ancient animals have been found in the southern portion of Arizona near the Mexico border. They are believed to have vanished around the time humans started roaming the Earth. During a cleanup of the Phoenix Zoo pond in May of 2010, a 62 pound “alligator-snapping turtle” was discovered. This creature has been described as “straight out of prehistoric times” and found living in the deepest part of the pond located in front of the zoo. The jaws on this amphibian are strong and able to snap off a child’s arm or leg. The Phoenix Herpetological Society says that this particular creature does not belong in Arizona. They believe it was an exotic pet of someone and they dumped it in the pond because they didn’t want to take care of it anymore. They have no idea how long it was living there, but felt it survived on the ducks, fish, and other turtles that existed in and around the pond. Even though that snapping turtle has now been removed, the Phoenix Zoo is a great place to visit and spend the day watching all the wonderful animals. 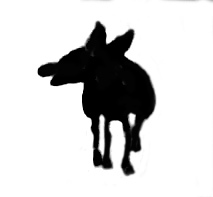 Okay, that chupacabra silhouette hilariously looks like our logo from today's post. Also, I've seen a 'mermaid' like that one before, and you're right, it's just a dead monkey sewn to the body of a fish, with papier mache used to blend it all together. Wonderful, right? I agree that the chupie picture does resemble your logo..... interesting. That 'mermaid' is crazy. Despite it not being an actual mernaid just imagine being the person who found it!! The Thunderbird story and the picture of the men in army uniform are not related. 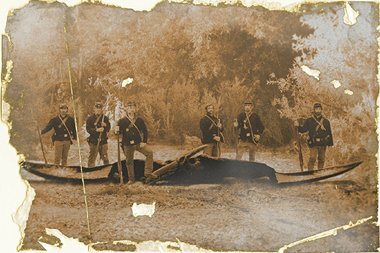 The picture is from the civil war and the men killed the creature. The other story about the cowboys is unknown to me. Sometimes fact checking will help with credibility. Yes I know and pointed that out.